An old one from 8 years ago. We’ve improved the layout for those of you who view J&M on mobile devices. Hope you like it. How can one call it a liar when it does not exist? The priests are liars and frauds and peculating parasites but their deities are not. The sacred books are full of lies and fantasies and hate and ugliness but the characters in them have no resemblance to any real person, living or dead. You can’t blaspheme against things that don’t exist. You can’t blaspheme against lies and delusions. You can’t blaspheme against gods and angels, demons and saints. “Blasphemy” is a null term, mere noise. Author, has the edit function gone away again? Yes, those are old thoughts but it’s an old comic so maybe they are timely? ThereAintNoBlasphemy – edit function still working for me. Your comments did go into moderation though – so maybe that’s why you didn’t see it. Author. Security stuff, perhaps? Ghostery, advertisement blockers and No-Script are here running in Firefox. I tried disabling some blockies. Maybe the edit-code only shows on new messages after making stuff unsecure? Ah, well. Such is Liff. I think this is what happened to the old edit function. I’ve haven’t seen an edit function in a long time. What? It got ett by security stuff? Well, these things happen. Many thanks, Author, for “J&M”. You are not only funny you also provide a delicate, gentle, refreshingly cool and breezy alternative to the blast furnaces of religious nut-jobs. Yours is a place of quiet repose amidst the craziness of ordinary life. Now, all we need to work out is whether J&M and Moses would vote for the first girly president or for yet one more old, white fart. I wonder what their various daddies are telling them? Hmm, I wonder how many patients this is testing? You were totally correct, Author. It was my security precautions. This message was done in Safari without any security and the edit thingy appeared. Have a truly marvellous day. Blasphamy is a victimless crime!..Like drugs; prostitution; gambling. As a Libertarian I oppose all victimles crimes. And think about the savings in all kinds of cost in fighting those “crimes”. IF they are simply legalised, there is the extra bonus of tax revenues. True, however, Mr. Bought-judge, copyright violation is not Piracy. “Piracy” involves ships, or perhaps aeroplanes and usually has some proximity to Somalia. Ooops … sorry … I just started a new DVD and there were the usual 30 minutes of advertisements for movies I really, really don’t want to see, a selection menu for the active language to be used while viewing and that irritating farking F.B.I. bullshittery. It may have no named deity but the religion of Capitalism is a religion. “Victimless crime”. Isn’t that an oxymoron? I suspect this entire message is slightly off-topic. ThereAintNoBlasphemy: Being a meanderthal is a requirement of the C&B. Author: Edit function O.K. no spam / robot verification though. Edit function? What’s an edit function? Ain’t seen anything like that in these here parts ever. Grumpy? Hi, how are the others? See Snow, recently? I don’t have the courage, but I really would like to stand up in the pulpit of a Muslim church (do they even have pulpitty bits?) and ask them if mocking Balder for being bolder but baldier than Thor with the thore thumb (of course Thor’s thumb’s thore, what else would he be hitting with that hammer?) is as blasphemous as some of the stuff we say about their little god? Is blasphemy inclusive? Commutative? Transitive? Nominative? Does it have a cousin in Kentucky? Yes, that was a small jest. I know it might only have been a little funny. A tiny bit of condensed humour. Mo actually makes a valid point. Poorly. Young ladies have a right not to be kissed by things like me. But I also have a right to kiss the young ladies because I want to. The church guys want to burn down me because I think they are all funny little people with strange habits and stranger delusions. I want to burn down all the churches because fires are pretty and I like to watch them flicker. I’m not fond of hurting folk but cathedrals and kirks are ever so lovely when in flames. Personally, I’d vote for the girls. I would always vote for the girls. What we we discussing? Oh, yes, moral relativism in a pluralist society. And beer. Actually, that’s not true. It was just a gedanken. Some churches are too pretty to hurt. But it does show that not all folk want to destroy the same things, preserve the same things or live with the same things. Some of us eat bacon. Pink, Mormonism? What about the Moonies? Or Heaven’s Gate? Or several hundred others? Aren’t the prophets who profited from propheting for their gods later than Mo? Could there be more than one Allah? Could Allah the Allahs be liars? Author, friend, could you delete my 1102 and 1108, please? And this one? Kissykissy. Thank you. Pink, I don’t know. What about the Moonies? Aren’t they big enough to be a religion instead of a cult? And the LDS’s were a tiny culty thing once. Even they admit that in their official histories. They started with one man and an angel. The Moonies and others could someday become as large as the LDS’s. Maybe. Perhaps even larger. Who can predict which cult is the next “Islam”? If a tiny cult became the Next Big Thing in fifty years or so, would the Islamists admit they were wrong? Would they join the next “last ever prophet”? Or would they continue to insist, even if the new religion became bigger and louder than theirs that theirs was the real true one? In short, is there a self-correction mechanism built into Islam? Pink, can’t allah the Allahs be the “one true god”? Allah-one would be the one true god of that bunch over there, Allah-two would be the one true god of the bunch living in the deep valley to the north of the first bunch, Allah-three would be the one true god of the guys who eat schwarma on Mondays and allah the other Allahs would be one true gods of other guys elsewhere. Or does the phrase “one true god” have some sort of singular exclusivity implied? What about this lot? And the others mentioned on this and other wiki-pages? Raëlism and Scientology could become the new Islams. Would the current Muslims be open to admitting their error if either happened? 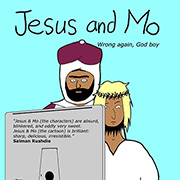 Would it then be “blasphemous” to insist on Mo being the last ever prophet? An old one, but relevant given that the Saudis are apparently about to resume flogging Raif Badawi for blasphemy. Anyone got some good ideas to help e.g get them suspended from the UN, banned from the next US presidential inauguration until they become civilised? Not sure an on-line petition would be useful. Judism, xism, islam, they are all approx 99,75 % right. Of the about 40,000 known gods, they claim only one is True. In dismissing all those gods, they are just 1 short. Renewable Energy. The US has the best democracy money can buy, and the Princes of Saud have ungodly amounts of money combined with Wahhabi fundamentalist dreams of a global caliphate. Is it any wonder that Wahhabi sharia sprouts every place the US touches? Is it any wonder that the US President rushes to kiss their shiny upturned bottoms no matter what. ThereAintNoBlasphemy, you wrote, Pink, can’t allah the Allahs be the “one true god”? Allah-one would be the one true god of that bunch over there, Allah-two would be the one true god of the bunch living in the deep valley to the north of the first bunch… . It explains that Judaism was really a subset of Sumerian/Mesopotamian religion, and that the Old Testament contains many Sumerian gods. When you read the Dead Sea Scrolls it becomes obvious that Abraham worshiped El and not Yahweh. Monotheism was created when the other Sumerian gods were called “Lord” or “Almighty” so that the reader thought that the text referred to Yahweh. If you click on the link to the Yahweh Elohim Web site, see the pages listed under An Ancient view of God and Yahweh in the left nav. bar for info. related to your “allah the Allahs” idea. I was struck by another thing you wrote, ThereAintNoBlasphemy. Young ladies have a right not to be kissed by things like me. I would acknowledge your right to want to kiss the young ladies, and the right to kiss a particular young lady if she consents to being kissed by you. Her relatives and other people (including your spouse, for example, if you happen to be married) may or may not honor these rights, however 😉 . As for Mo’s point, I think that, in a civil society, the blasphemer has the right to blaspheme (expressing disapproval of religion), and a follower of religion has the right to express disapproval of blasphemy. Each can try to persuade the other to change his/her views by using rhetoric or by acting as an example of someone with his/her views who lives well. But when one expresses his/her disapproval by harming the other (or inciting anyone to harm the other), that is taking a step towards the breakdown of civil society. This could be the start of a conversation about what rights are, and whether they exist independently of human society. (For example, in 1776 it was acknowledged in the fledgling United States of America that all men have the right to life. Yet in any year, a man may find that this right does not exist in nature when he’s killed by a bear, a virus, or a stroke of lightning, and nature makes no amends to his kith or kin.) If society A honors (or at least professes to honor) a certain right, but society B does not even acknowledge that there is such a right, does that right exist in both societies, or only in society A? Does a right come into existence when someone demands it, or when it’s both demanded and acknowledged–or, better yet, honored? For example, did a woman’s right to vote exist before anyone demanded it? Did it come into existence as soon as someone wanted it to be a right? When a person demanded it? When a certain number of people acknowledged it? When it became law? When the first woman exercised her right to vote? What about customary rights (rather than legal rights)? Over to you all 🙂 . Barmaid, may I have some mulled cider, please? I remember when the discussion here was usually legible, often witty, and even intelligent. NoBlasphemy, it doesn’t matter how often you change your ‘nym, your dreary, repetitive, self-abasing style never changes, and neither does your desire to sexually assault women. Of course you don’t have the right to kiss women just because you want to, just as I don’t have the right to punch seven shades out of the people who have ruined my local by turning what was once the only comments section on the net worth participating in, into just another hotbed of inanity, however much I might want to. Mo’s attitude does not allow for any actual conversation on the topic. When conversation is not allowed, then ridicule and satire are not far behind. It is the attitude that helps a magazine like Charlie Hebdo survive to mock their foolishness. 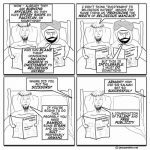 NoBlasphemy simply doesn’t understand that if he wants to have the ‘right’ to impose his will on others, then others also have the ‘right’ to impose their will on him. The women, their friends and family would all have the ‘right’ to show you how they felt about your actions, in any way they wish. That might not work out so well for you in the end. The same holds for others opinion of your chosen religion. If you want to impose your views on others, don’t be surprised if they instead impose their views on you. The more evolved societies have realized the never ending problems with this and have agreed that peoples ‘rights’ end when they affect others in the society. For example a society [Iran?] might permit marriage to nine year old girls to be legally consummated, it would not be a right in other less liberal societies. Amen, old darling. It’s not the same, with all the racket made by the fruit machines. Had to find another local some time ago. Anybody know why the J&M feed is not coming through in igHome anymore? The entire panel is white (blank) where usually the current and one previous strips are visible. Everything else is working perfectly. Newtonian – I am making inquiries. Is it that “Islamic humans” are different from other humans? If that “Islamic rights” are different from other rights? If only you were less conceited, you might have noticed the irony in your telling AoS to get his own J&M page. For some considerable time, you have treated J&M as your own personal web page, where your every last inconsequential, unstructured, half-formed brain fart gets an airing. You do this because, as you must be dimly aware, if you put it on a personal blog, no-one would read it, for the same reason I’m fairly sure that most J&M regulars reflexively scroll down at the sight of the dragged-up horsie. It is simply too tedious for the reader to keep having to recompose the rubble of your syntax into something resembling a train of thought, or a considered point of view. An ‘idyll’ is something wonderful but implicly unsustainable, which is what you have made of the witty, warm and thoughtful site this used to be, where people only posted when they had something genuinely interesting or amusing to say, and had the basic courtesy to readers to write in complete sentences. I see, the meanderthals are now inane.